We have a soft spot for Lenovo’s Yoga range, which offers a wide variety of interesting and affordable choices in the market segment known as ‘laptops that sort of turn into tablets by folding the keyboard round’. But we do wish Lenovo would decide what they were going to put on the inside of them and stick to it. This 14in model turned up in the Computeractive labs with a high-end quad-core AMD Ryzen 7 2700U processor and a price tag to match, although we spotted it in PC World with 10 percent off. Lenovo’s own website, meanwhile, lists three completely different models, all cheaper and with processors from Intel rather than AMD. The range starts at just for a dual-core Pentium 4415U chip, which is not fast, but faster than the 4415Y in Microsoft’s more portable Surface Go. Then again, the Surface Go is cheaper. 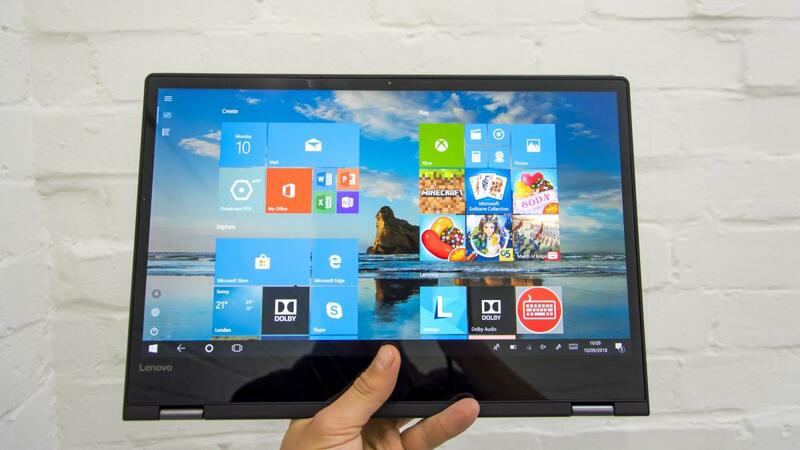 So it’s hard to say what we think of the Yoga 530. Booting up our thousand- pound version, we were immediately underwhelmed by the screen, which covered just 55 percent of the sRGB colour range, making it completely unsuitable for graphics work. It looked noticeably dull even for basic purposes, and – thanks to its low brightness levels – worse under strong lighting or outdoors. That limits the benefit of the decent CPU, which in any case didn’t seem to be hitting its peak performance. Our test scores came out narrowly behind an Asus ZenBook 13 with Intel’s i5-8250U, which is interesting. Maybe that’s why the AMD version is hard to find? The Ryzen 7 2700U’s built-in Radeon Vega 10 graphics card should be a real selling point, but we struggled to get smooth frame rates in 3D games benchmark tests at Full HD. We’ve seen far better results from the reasonably priced GeForce MX150 graphics card. And the final straw for the Yoga’s AMD version was that the battery packed up after just three hours 47 minutes of video playback from the SSD, which doesn’t even tax the processor as much as gaming or some online activities. The SSD, incidentally, was about twice as fast overall as the standard SATA-speed units we still often see, albeit half the speed of many newer NVMe drives, and this did help to keep everyday Windows 10 tasks feel nice and snappy. Although we can’t confirm without testing, we’d expect similar storage results and longer battery life with the Intel models – Lenovo quotes up to eight hours. And apart from the screen, the Yoga 530 isn’t too bad on the outside. True, it’s on the bulky side for a fold-back hybrid, and plain in a way that just looks unimaginative rather than minimalist. But there are plenty of ports, an SD card reader and a fingerprint sensor, which saves typing a password to unlock Windows. We found the backlit keyboard well spaced and comfortable to type on, and the touchpad worked well once we turned up its sensitivity setting a notch for multi-finger gestures. The built-in Harmon Kardon speakers won’t get a party started, but they’re fine for watching TV on the internet. Overall, we can’t recommend the Yoga 530 that we tested because we wouldn’t spend serious money on a laptop with such a drab screen and less-than- blistering speed. At the lower end of the range, though, and if you’re not bothered about display quality beyond everything being basically visible, it could be worth considering. Now discounted, this i5- 8250U/MX150 laptop isn’t touchscreen but weighs less and lasts longer.